As much as I adore homemade jam, I’ve always considered it an enormous gamble. The more I invested in time and ingredients the higher were the odds I would end up with a runny syrup or a rubbery mass better suited for Gummi Bears than toast. Perfect preserves eluded me. Neither the old-fashioned cookbooks I inherited from my mom nor the new crop of canning guides and web sites were much help. Most of their recipes relied on commercial pectin and called for specific amounts of sugar and fruit, stated in cups. All advised checking whether the jam had set by watching it drip off a spoon or cling to a chilled plate – imprecise measures at best for the uninitiated. Then I ran across Russ Parsons’ advice in the Los Angeles Times this summer and everything began to make sense. He offered a simple ratio for making small batches of jam using equal weights of sugar and whatever fruit you have on hand. Because you cook a limited amount of preserves at a time in a non-stick skillet, it’s easy to tell whether it’s ready just by watching the syrupy mixture become thick and glossy as you stir. Flavors are also fresher. Parsons still advocates the dripping spoon method of checking for jelling, it’s true, but the technique is beginning to make some sense to me as I make more jam. Just to be safe, I’ve also tracked down a couple of references for jelling temperatures to compare against the signs of the spoon. I fare much better now that I employ an instant read thermometer to check my jam. The base line is 220 degrees at sea level and a couple of degrees less for each thousand feet of elevation – or 218 degrees at my house. I’ve also given up on commercial pectin, which sets too quickly and firmly for me. No longer do I make dense and sticky jam that I can barely pry out of the jar. Instead, my jams are soft and smooth, singing of ripe fruit and spice. 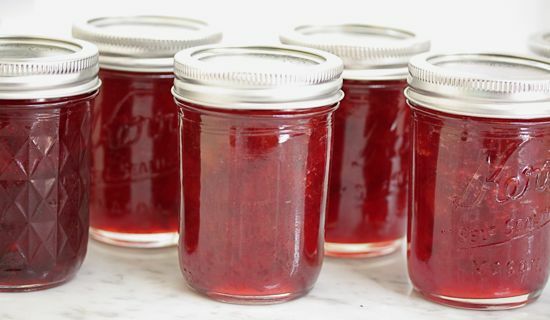 Using Parsons’ technique, making jam is no longer a daunting enterprise involving scary vats of scalding hot syrup and high odds of failure. Small batches are easy to handle and encourage experimentation with flavors. The colorful jars on my shelves are filled now with the likes of strawberry, rhubarb and cardamom or blackberry, lemon and Asian pear jams. Most recently I’ve been playing with the season’s plums and pluots – a cross between plums and apricots – spiked with freshly grated ginger. This method of making jam requires little specialized equipment other than a kitchen scale. Because you’re only cooking a couple of cups at a time, you can avoid the hot water bath processing altogether if you like and just stash your preserves in the fridge. If you do opt for canning, you don’t need such a large pot of water since you’ll only be doing a few jars at a time. I’ve downscaled to a tall stock pot with a folding steamer basket in the place of my massive graniteware canning kettle. A canning funnel is helpful. Cooking times are reduced, too, because the fruit and sugar sit unattended off the heat for hours after you’ve brought them to a boil. 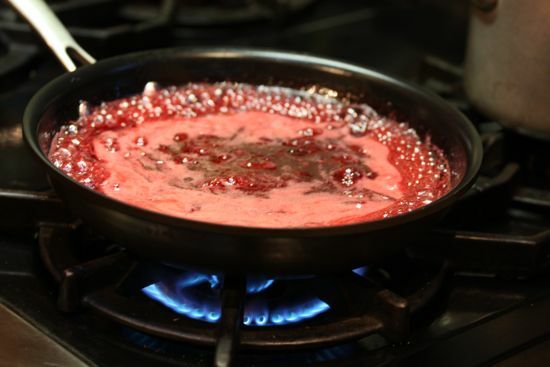 When you put a couple of cups of the macerated fruit mixture in a non-stick skillet, it only takes 5-10 minutes to get to the jam stage over medium heat. Even if you cook off several batches, it doesn’t take long. 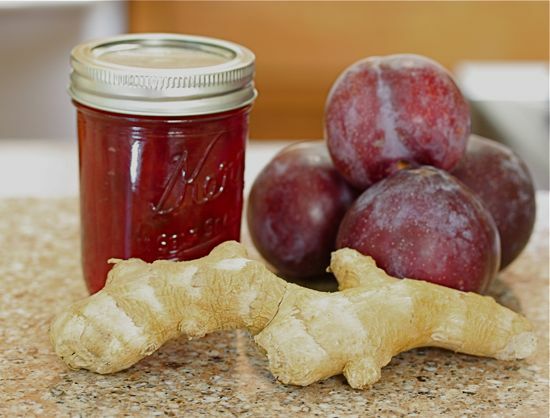 I’m giving a formal recipe for the pluot and ginger jam here because it’s often easier to follow a step-by-step procedure the first time around. But feel free to substitute whatever fresh fruit is in season and any flavor accents that appeal to you. Many fruits, such as plums, contain so much natural pectin – the thickening agent in jams – that you don’t have to worry about them setting up. Others, such as blackberries, can use a little help from mixing with a small amount of a high-pectin fruit like apples or Asian pears. It’s actually better if some of your fruit is a little under-ripe because it will contain more pectin and jell easier. Have fun and let your imagination run free. Next winter, you’ll have the flavors of summer sitting on your pantry shelves just when you need them the most. Chop the fruit into bite sized pieces, weigh and put into a large, heavy pot. Weigh out an equal amount of sugar and add it to the pot. Bring the mixture to a boil over medium high heat, stirring to prevent sticking and burning. Remove from heat and let sit, covered, overnight or at least 8 hours. If you’re going to can your jam, prepare jars and lids just before the final stage of cooking. Wash jars in hot, soapy water, rinse thoroughly, and place as many as will fit without touching right side up in a tall stock pot with a rack or folded dish towel in the bottom. Fill pot with enough water to cover the jars by a couple of inches, bring to a boil and boil for 10 minutes. Leave jars in the hot water while you make the jam. Peel ginger and grate directly into the macerated fruit. Stir well. Ladle 2-3 cups of the mixture into a non-stick skillet and cook over medium high heat until it begins to boil. Lower the heat to medium and cook, stirring constantly, until mixture becomes thick and glossy, about 5-10 minutes. The jam should reach a temperature of 220 degrees at sea level and a couple of degrees less for every thousand feet elevation. Or you can check with a cool metal spoon: When the syrup begins to sheet off the side of the spoon, it’s ready to put into jars for canning or storage in the refrigerator. Remove a jar from the pot, drain out any water and insert the canning funnel. 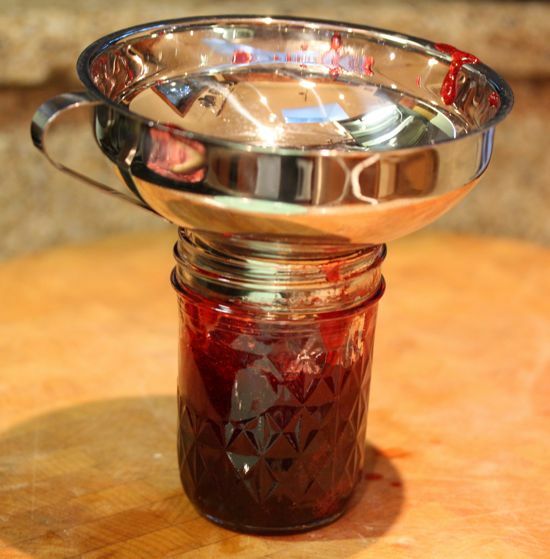 Fill jar with jam to within ¼-inch of the rim. Wipe the rim with a clean, damp cloth. Fish a lid out of the canning pot and place atop the jar with the rubberized ring facing down. Lightly screw the cap down with a ring and place jar back into the canning pot. Repeat until you’ve used all the jam. Bring pot to a boil, adding more water if necessary to keep the water level at least an inch above the tops of jars. Boil 10 minutes, then turn off heat and let jars sit in pot for 5 minutes. Repeat the cooking and canning process a couple of times until you’ve finished up all the macerated fruit. It doesn’t take that long since the water has already boiled in the canning pot. Just be sure to refill with boiling water when needed so the water level doesn’t drop. It’s hot. Have any suggestions for a savory, cold melon soup? Good thing it’s starting to cool off, Sheila. I’ve never made a melon soup, sweet or savory. I’ll take this is a challenge since good melons are starting to show up at the farmers markets. Bought a Galia today with a beautiful aroma.